Neatly timed to release as Jurassic World prepares to open its towering gates, Fossil Fighters Frontier positions itself to tap into our love of all things prehistoric. Your journey begins as a young candidate chasing his, or her, lifelong dream to become a Warden. The Wardens are an organisation entrusted with maintaining peace and safety at the world’s Fossil Parks, headquartered at Fossil Park Asia that floats about on the Pacific Ocean. Meeting the other candidates, you are briefed by Captain Stryker before undertaking the final Warden Test that you will need to pass in order to become a full-fledged Warden. By this point, you’ll immediately want to run away from annoyingly overenthusiastic Australian candidate Sydney, whose opening lines are all particularly embarrassing stereotypes, if harmless to the young crowd that Fossil Fighters Frontier will likely attract. When he isn’t all “Crikey, mate! Got me didgeridoo all warmed up to play some Waltzin’ Matilda,” it’s “Well throw a shrimp on the barbie and let me give ya a right earbashin’.” Enough said. Your character, who works directly with Captain Stryker, is given a special mission to look after an admittedly adorable, small vivosaur that you form a bond with early in the game. Fossil Fighters Frontier will see you travel globally using the World Gate, with the little critter wandering behind you as you visit other Fossil Parks to complete fetch quests listed on the Missionator 4000. 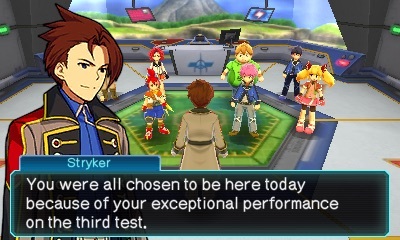 The Warden Test acts as your tutorial to what you’ll be busying yourself doing in Fossil Fighters Frontier‘s world. Gone is Jurassic Park’s need to extract DNA from mosquitoes preserved in amber, and in its place are roaming Bone Buggies. These vehicles are used to drive around the game’s Fossil Parks, helping you to explore their large expanse using VR-00M, the onboard navigation system, and your Fossil Sonar to uncover specimens. Once discovered, you will enter a mini-game of sorts as you carve through the fossil’s rocky prison to break it free. Your battery strength indicates the amount of time that you have to complete the excavation, but, while I always thought it was a careful procedure, Fossil Fighters Frontier makes child’s play of it. Armed with a hammer, drill and, later on, chisels, you’ll break up and chip away at regions of rock – tapping an X-ray icon to illuminate the fossil’s position in an eerie green glow. That’s all easy enough, but recovering the fossil is only the start. These are then used to automatically revive the dinosaur that they once belonged to, a process made possible by Professor Little’s fossil-energy studies. This has resulted in the creation of a compact fossil-energy materialisation device, or a miniature revival machine for short, that is installed in your Bone Buggy. 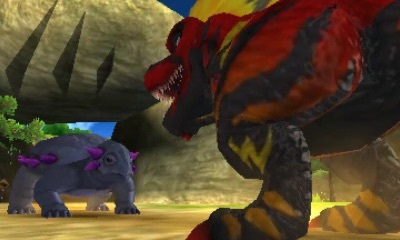 No longer the dinosaurs that they once were, Fossil Fighters Frontier refers to these resurrected creatures as vivosaurs. These are stored inside Dino Gears that Wardens carry around, summoned whenever they’re needed to compete in Fossil Battles. There are more than 80 vivosaurs that you can recover, the more interesting of which is secured in Challenge Routes that see you race against a Fossil Eater to secure rarer gold fossils. But, despite a relatively small number, they’re all largely forgettable designs. That means that players are likely to stick to their favourites, raising them quickly to the relatively low-level cap and relying on them for their strength to see Fossil Fighters Frontier through to its conclusion. Once you pass the Warden Test, you are encouraged to compete in the Fossil Stadium tournaments to increase your license class that in turn raises your Warden Rank. This heightens your Fossil Power (FP) Max and Recharge, which is consumed by your vivosaurs in a battle to unleash their skills each turn. It’s important to note your opponent’s element type for the chance to counter it with a vivosaur of an opposing element to deal extra damage, while players can call on limited Support Shots in a battle that raise your attack that turn or help by replenishing your vivosaur’s health. Disappointingly there’s never any real need to consider strategy, players easily getting through most fights by just selecting their strongest skill and beefing it up with Support Shots. That’s worrying enough because these battles are the crux of Fossil Fighters Frontier. Tournaments see foes change type depending on the day of the week, whereas traversing the Fossil Parks will require you to chase down rogue vivosaurs that have gone astray after they have been revived. They can be faced alone, although you’re encouraged to partner with a Paleo Pal so that you can strengthen your friendship with them over time. 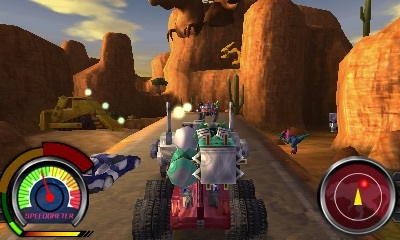 Multiplayer is well-supported in letting up to six players battle locally, whereas you can head online to take on a single opponent. Locally you can team up in three vs. three co-operative tournaments or, with two players, explore dig sites together. Meanwhile, battling online lets you compete in monthly rankings to earn yourself class and rating points. That’s not all either, with StreetPass support letting you send a vivosaur to other players for them to train against – a wider the ranking gap between you raising the experience received. There’s a Pokémon undercurrent to Fossil Fighters Frontier that’s hard to shrug off, although it’d be unfair to not appreciate that it does enough to strike out on its own accord. But Fossil Fighters Frontier doesn’t manage to deliver an impactful experience, and it could even take a leaf out of Digimon’s playbook to make it more memorable. Those with a fondness for dinosaurs will still find enough to enjoy, but for everyone else, Pokémon remains the better choice.